R3's Global 40 report reveals how marketers and agencies keep the romance alive. The average lifespan of a marketer/agency relationship is 3.2 years, but Unilever has managed to work with the MullenLowe for 117. R3 reveals the secrets to this partnership and others in its first-ever Global 40 report. The marketing and agency-search consultancy spent three months evaluating entries from the world’s top 100 brands before closing in on 40 that represent the longest partnerships in the industry, boasting 22-year average terms. Unilever isn’t the only brand circling a century. General Electric and BBDO have been together 96 years, Mars and BBDO have lasted 80, and Levi’s and FCB celebrate 43 years together. The rest of the top 10 longest tenures drop to 34 years or less. 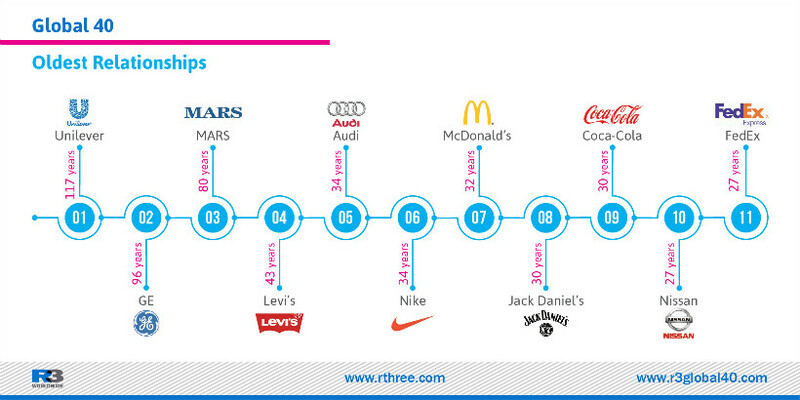 On the agency side, BBDO claims the most relationships with five (FedEx, GE, Johnson & Johnson, Mars and Visa), followed by FCB (Jack Daniel’s, Levi’s and PACCAR) and McCann (CPW, MasterCard and L’Oreal) with three each, and the rest of the top 10 with two each, including Laundry Service, Ogilvy, McGarry Bowen, OMD, Publicis, TBWA and Wieden + Kennedy. How do these brand/agency relationships outlast changes to the C-suite? The Global 40 report lists "Six Secrets of a Great Global Marriage." First, "look to new models." As in a human marriage, agencies and clients should continue to keep things fresh—whether it’s the Brand Agency Leader model or IMC innovation. Next, "face time matters." Don’t just depend on emails and phone calls. Visit each other’s offices or hop on a video conference. Third, "focus on outcomes, not inputs." Don’t waste your time negotiating the appropriate compensation; instead, agree on payment based on how much you sell and what it will do for the brand’s equity. Fourth, "take digital seriously." Digital is often considered an annoying marketing buzzword, but it’s important. Invest in your digital agency hires for the long-term, so you develop a digital strategy, not just a one-off execution. Fifth, practice "immersion both ways." Agencies should flip burgers if they’re working for Burger King, and marketers should visit their agencies’ offices and become their advocates. Last, follow data in terms of "benchmark and evaluate." R3 points out in its findings that Johnson & Johnson excels in evaluations, "actively asking agencies for feedback on how they can become a better client." This last bit of advice mimics a finding that the Association of National Advertisers released this week: More than 80 percent of marketers use data to manage their agency relationships. The study "Using Data to Manage Agency Relationships: What’s Important to Marketers" found that data should be used as "a force for good" in client/agency relationships. "Data helps build better relationships between the client and agency, helping both parties focus on outcomes," said ANA Group Executive Vice President Bill Duggan in a press release. "And at a time where there are transparency issues in the industry, the use of data enhances trust." 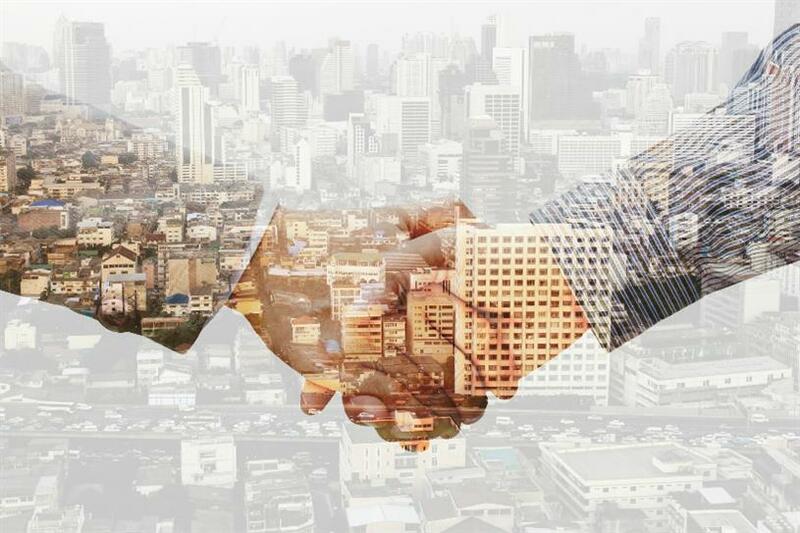 At a time when the advertising industry has been plagued with top talent leaving for the tech sector, rebate interrogations and fractured partnerships, witnessing 40 examples of agencies and marketers who collaborate well should a welcome respite. "We felt that there were still a lot of client/agency relationships that were delivering great brand equity and business growth, and we wanted to celebrate that," said R3 principal Greg Paull. "It’s a challenge as this industry looks out for the next pitch or the next problem, and we wanted to celebrate some of the successes."